By Donavan Leonard: Unfortunately for boxing fans, there is no yearly playoff to determine the worthy holder of the crown in each division. While a plethora of titles is a boon for creating business (sanctioning organization fees, more bouts with “more at stake”, better paydays for lesser-known belt holders), it is a bane when it creates champions who, through luck or clever management, are not worthy to hold a title. It does not necessarily mean that the fighter is not good enough to be a true champion over time and continue defending the crown, or that the fighter would not have one day been able to earn the crown outright. What it does do is water down the meaning of being called a “world” champion. There is no need to plow through a list of contenders to earn a shot at the title, and there is often no need to even fight a recognized champion–knocking the king off of the hill. The filling of vacant titles or interim titles which become elevated to “full” champion status has become nearly as common as fighting the reigning beltholder. There are 68 champion slots, with only 40 of those slots being filled by beating the fighter currently in possession of the belt. With four generally recognized organizations with their own separate top-15 ratings, there is the potential that these bouts involve at least one opponent being, at best, the 60th best fighter in the weight class in the world. The following is a list of the ten titlists with the weakest claims to their crown. Their worth may be proven over time, but the path which has led them to be called a champion is tainted. If a fighter has made more than one defense of the crown they are excluded. The defenses, however weak, give some semblance of credibility. Boxrec rankings, although imperfect, are used. This is because the site ranks each fighter, not just those who have paid membership fees to an organization in exchange for the opportunity to be presented to the ratings board. Denis Lebedev, WBA Cruiserweight champion. The fact that he is a champion is incomprehensible. In December 2016 he fought Murat Gassiev for the IBF and WBA titles. He lost. The WBA determined that his title was not really at stake in the contest, so he has kept his crown. Beating an unknown fighter for a vacant title is one thing, but losing to a fighter in a title bout (with no strings attached–positive PED test, etc.) and keeping the title is mind-boggling…except in boxing. Sergey Lipinets, IBF Junior Welterweight champion. Lipinets was positioned as the mandatory to former unified titlist Julius Indongo, but Indongo opted for an historic bout with Terence Crawford instead. Crawford won easily and immediately vacated the titles and moved to welterweight. The IBF then approved a fight for the vacant title with #72 Akihiro Kondo. That is correct, the #72 ranked fighter contesting for a title belt. Lipinets won a closely contested bout, and is now scheduled to fight one of the hottest fighters in the game, Mikey Garcia, in February. A win or even a competitive showing against Garcia will aid fans in forgiving the IBF for blessing the abhorrent (on paper) title-winning affair with Kondo. Dmitry Bivol, WBA Light Heavyweight champion. Bivol first tasted a professional title when he defeated #62 Felix Valera for the interim belt. With the retirement of Andre Ward, the bout with #41 Trent Broadhurst was given the green light to be for the full WBA belt. The mismatch in the ring was somehow even more one-sided than it appeared on paper, as Bivol knocked out the over-matched Broadhurst in a single round. Fortunately he is scheduled to face a live opponent in Sullivan Barrera (ranked #4) in March, but as of this writing this represents one of the weakest paths imaginable for a title. 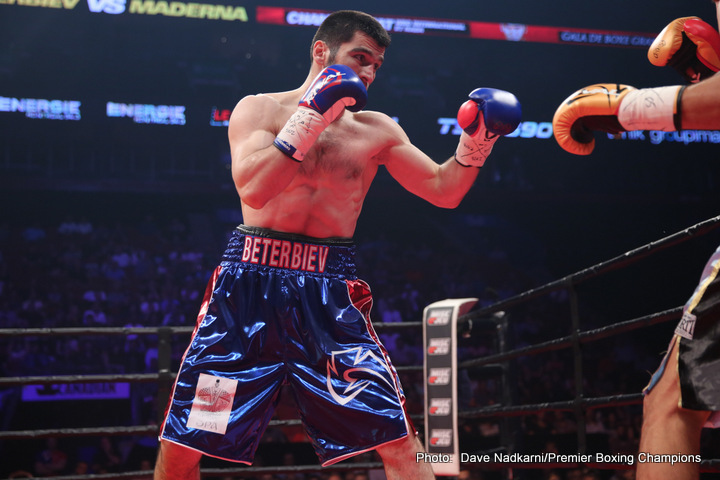 Artur Beterbiev, IBF Light Heavyweight champion. As much as the retirement of Ward opened up the potential for exciting bouts in the light heavyweight division, it also opened up the door for poor quality in matchmaking. With seemingly every respected contender fighting for a vacant belt, waiting in line for the next title bout, recovering from injury, in the middle of negotiations, or not interested in taking risks, the organizations acted quickly to gain a new champion. For the IBF, that resulted in Beterbiev taking on #40 Enrico Koelling in a non-mouthwatering contest for the vacant crown. Nearly 12 rounds later, Beterbiev finally dispatched of Kolling. The winner was never in question, as it was clear that Koelling didn’t belong in a world championship bout. David Benavidez, WBC Super Middleweight Champion. When the bout between Benavidez and #26 Ronald Gavril was signed, it was expected to be the coming-out party for Benavidez, the man aiming to become the youngest super middleweight champion. Benavidez weathered the storms of the busier Gavril and put enough rounds in the bag so that even though he suffered an off-balance knockdown in round 12, he still came out victorious. This bout showed the boxing world more about Gavril, who had largely been ignored since he lost an eight-round decision to Elvin Ayala in 2015, than it did about Benavidez. Boxrec is imperfect, and Gavril appeared to be much better than only the 26th best super middleweight in the world. The two will square off once again in February with the chance to show decisively which of the two is the better man. Filling vacancies is a necessity. When fighters retire or move up in weight it leaves a hole which understandably must be filled. However, it is disappointing when a championship bout does not contain two championship level contenders. When Juan Carlos Ramirez (#17) fights for the vacant WBC junior welterweight title, it will be against Amir Imam, rated #72. On paper, this should be a rout, and if it appears that way on paper, the organizations should rethink sanctioning it as a championship bout. Imam may very well find a way to win, and if he does, good for him. However, it is more likely that Ramirez will find himself one of about 30% of all titlists, winning a title yet never beating a champion to become one. In lieu of being able to be the man who knocked the king off his perch, it would be best for the sport if the champion could honestly say that they beat the best in their division to take the crown. Anything less and perhaps the sanctioning bodies should start passing out participation trophies.